The AutoStar II computer controller helps you quickly find and GoTo over 30,000 objects in the night sky. With the AutoStar II Controller plugged into your Meade telescope the astronomical universe is in the palm of your hand. Never before has such powerful telescope technology been so easy to operate, even by the most casual observer. Coiled cord and instructions included. 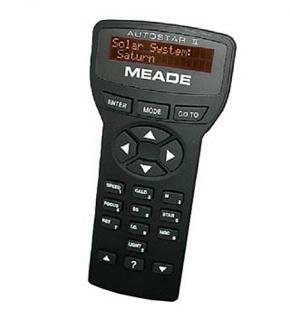 The Meade AutoStar II Controller (SKU: 07200) is compatible with the Meade LX200 ACF, LX200 GPS, LX200 R, LX400, LX600 and LX850. Once aligned with the sky the AutoStar II is ready to take you to any object in the over 30,000 object database. In addition to GOTO and tracking capability the AutoStar permits a wide array of fascinating and educational functions such as multiple Guided Tours, digital positional readouts, a database of user-defined objects, 9-Speed dual-axis movement, the ability to link with a PC using optionally available software and cord, and much more. 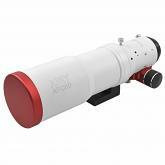 Note: The AutoStar II handbox is not compatible with the Meade LX200 Classic models. Important: Do not plug or unplug the AutoStar, AudioStar, AutoStar II or AutoStar III Handbox to your telescope while the telescope is switched on.